The animals in circumambulation around the stupa of Paranirwana offer flowers and jewels in their mouths. It expresses the wish of Buddhist practitioners that all suffering in the animal realm may cease and all animals reach Nirvana, the state of no-more suffering. 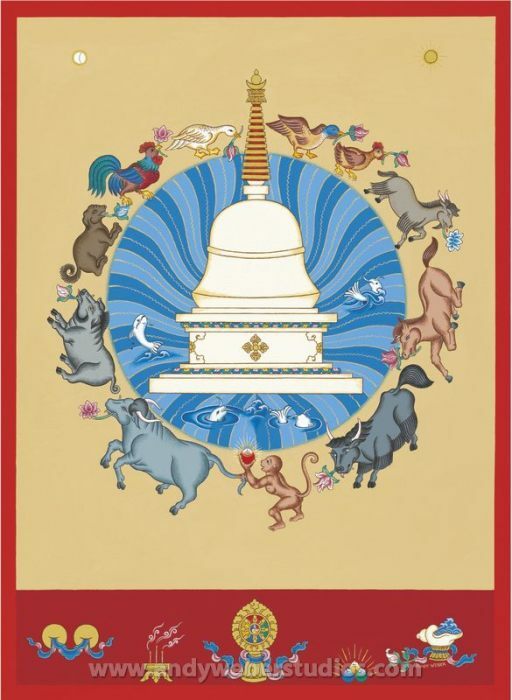 This painting is based on the logo design created for the “Animal Liberation Project “ charity (www.enlightenmentforanimals.com) and inspired by the great visionary Lama Zopa Rimpoche of Kopan monastery in Nepal. A percentage of the sales will support the charity.